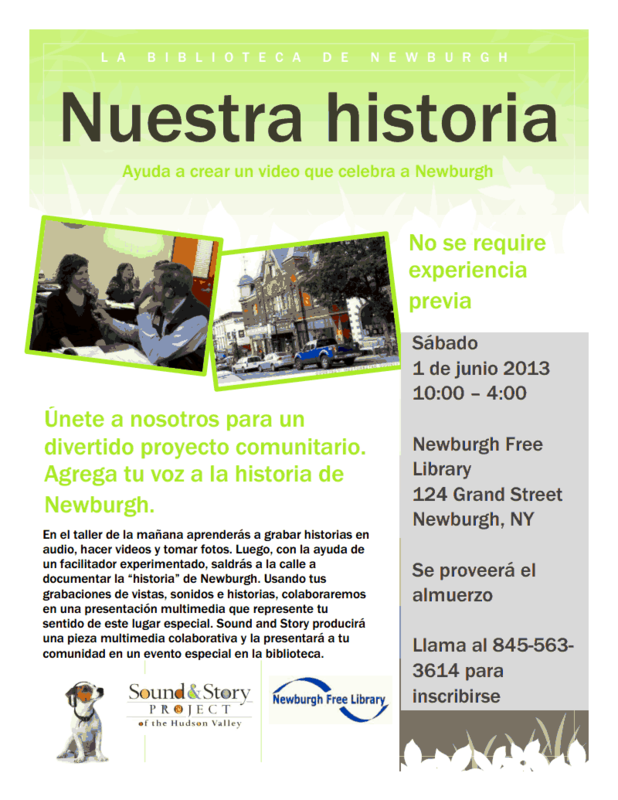 The Sound and Story Project whose mission is to strengthen community through the power of listening, and the Newburgh Free Library invites the community to participate in the making of a multimedia documentary featuring their personal impressions of Newburgh. “Our Story,” a collaborative multimedia program, will take place at the Library on June 1, 2013 from 10:00 – 4:00. Contact Chuck Thomas at 845-3614 to reserve a space. Community members, assisted by local artists Eileen McAdam, Mia Lobel, Ilene Cutler, and Mariel Fiori, will record stories, take photos and shoot video to tell the story of Newburgh through their eyes. From the material collected and the participant’s impressions, The Sound and Story Project will produce a multimedia presentation that will premier during a public celebration at the Newburgh Free Library. To follow the project and learn how to participate, visit soundandstory.org and Facebook.com/soundandstory. This program is funded by the New York State Council on the Arts. One small correction: To reserve your spot, please call Chuck Thomas at 845-563-3614. It’s going to be a great time!